Imagine a situation where wake up late for work and when you rush to the shower you find that the hot water tank is empty. I bet very few of you would welcome the idea of taking a cold bath especially in chilly morning. What if I told there is a way you can avoid all these inconveniences? Well, investing in a tankless water heater will not only cut your energy bills but also provide you with hot water when you need it. Does this sound like something you would want? 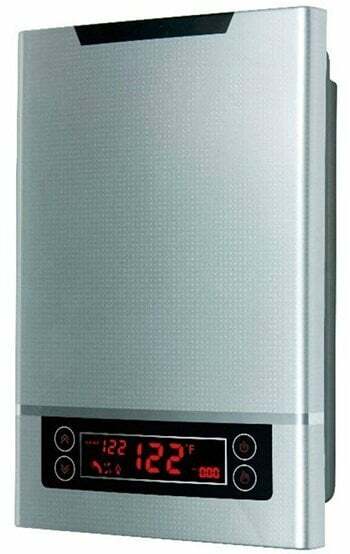 If it is so, reading this article will help you to get all the relevant information you need to know about the best tankless water heater. 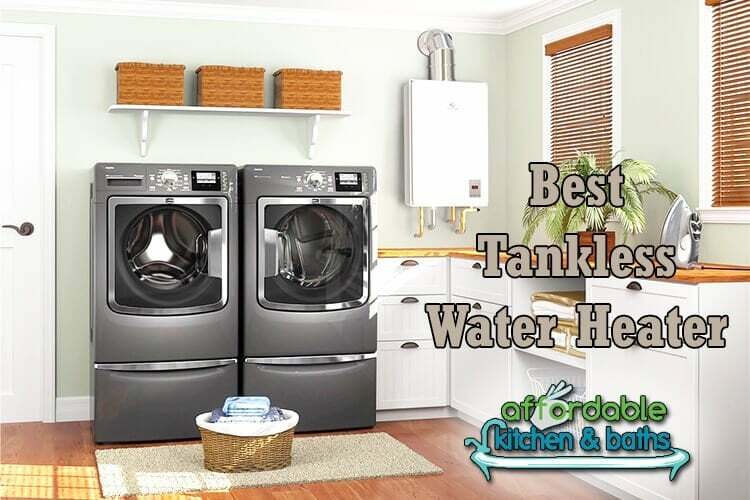 Whether you are thinking of building a new home or replacing your old water heater, we have prepared a list of the best tankless water heaters that enhances your convenience. Going through these products will help you know the unique features that come with each model, allowing you to make a more informed decision. 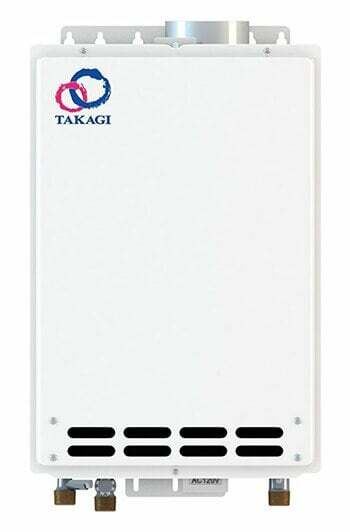 If you are thinking of replacing your old water heater, the Takagi T-KJr2-IN-NG tankless water will not disappoint. This unit boasts of new technology as well as extra advanced features for added convenience. We love its ability to give more flow of water per minute as well as its ease of use in the cold temperatures. Lets us look at the extra features that make this water tank to stand out. 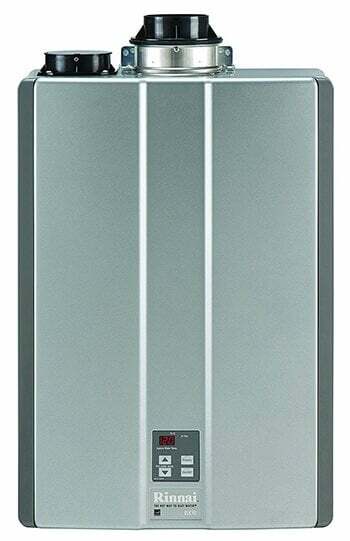 This tankless water heater has impressive ability to generate as much heat as 140,000 BTU (British thermal units) per hour. This performance allows it to produce hot water in cold areas while consuming less energy when compared to traditional models. Well, if you live in cold areas, having a high parlance is essential. However, most of the traditional water heater consumes a lot of energy to produce enough water for you and your family. This water heater is fitted with inlet and outlet thermostats that allows you to monitor the water temperature efficiently. This ensures that the heater delivers water at the right temperature whenever you need it. 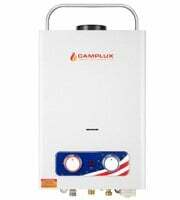 This is a great choice for individuals who are looking for a high capacity tankless water heater. This heater is backed with modern technology that allows for more gallons water flow. It is also a perfect choice for individuals who would not mind paying extra for a water heater that offers them with a long-lasting service. 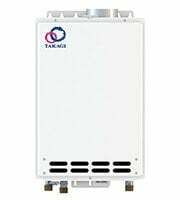 If you have a large family or live in areas that are extremely cold, you need a tankless water heater with high performance. This will allow that you get enough water for your whole family. This unit has a max BTU of 199,000 that will take the needs of a large family who lives in cold areas. When selecting the best tankless water heaters, you also need to ensure that it has low Nitrogen Oxide emissions. This unit has ultra low Nitrogen Oxide emission ensuring that your family is safe. Another feature that most people love about this unit is its space-saving design. You do not have to worry about storing the heater as it comes with a compact design that allows you to store almost anywhere in your home. 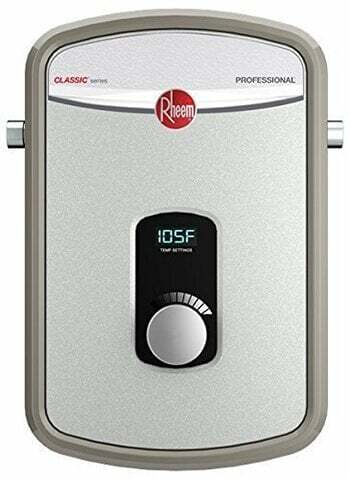 Rheem brand has incorporated modern technology and advanced features to come up with tankless water heaters that are more efficient. You will enjoy all the features that you get from high-end brand plus even more saving. It is a great choice for both small and big household with a high demand for hot water. 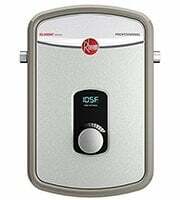 Besides, this water heater from Rheem is not intimidated when used in extremely cold areas. Besides having an energy efficiency of 99.8 percent, which is impressive, this unit is constructed using high-quality materials for durability. For enhanced performance, the unit comes with durable copper immersion two heating elements that heat water fast and efficiently. Gone are the days where you used to contact a professional for every installation in your home. You can save a lot of money on installation when you purchase this unit. You are provided with the step by step guide as well as the tools needed. The unit also comes with 0.5 NPT adapter and 3-foot electric cable. To make it easy for you to customize the temperature to meet your requirement, this unit has an adjustable digital thermostat. We love the simple control with a LED display that enables you to set the temperature you need. This tankless water heater promised to offer more than enough for the price. 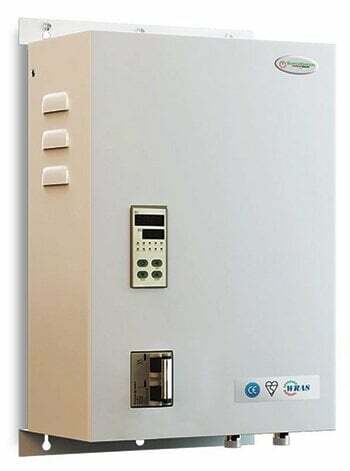 This unit provides you with continuous flow of hot water at optimal temperature. Backed by advanced technology, compact design, and impressive energy-saving performance, you are ensured to get exactly what you need. 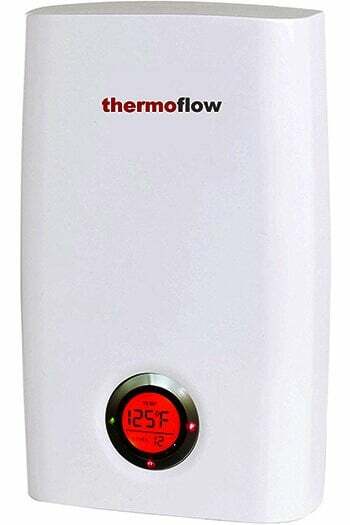 You can now replace your old heater with the thermoflow tankless water heater for reduced energy bills. With this unit, there are no standby losses that are associated with most of the other models available on the market. We love the impressive performance that allows this heater to heat water continuously for as long as you need it. This ensures that there is an endless supply of water everytime you need it. With a user-friendly digital display, it is very easy to control the temperature and customize it to fit your needs. Moreover, this unit has the self-modulating temperature tech that prevents warm and cols fluctuations when in use. Regardless of the water temperature from the main supply pipe, this unit ensures that the water is heated evenly. 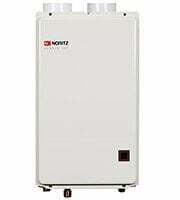 There a number of reasons why we have included this unit on our list of the best tankless water heater. This model does not only come with an attractive design but also is well made for enhanced performance. The unit is also come with excellent power saver technology making it convenient to use in a home. Moreover, you are providing with digital temperature controls that enable you to adjust the temperature to suit your needs. This is an excellent choice for a small apartment, lodge, cabin, boathouse, and campsite. You can also use it in RVs and campers. This allows you to enjoy hot showers while you enjoy the outdoors. Besides having a compact design that fits in small spaces, the design is aesthetically pleasing. This makes it a nice addition to your bathroom, giving it a stylish look. Similarly, this unit has a folding handle that makes it easy to transport. Installing the unit is super easy. You simply need to hag it with the handle provided, connect it to the gas cylinder then connect the shower hot. When you complete these simple tasks, you can start enjoying hot water instantly. 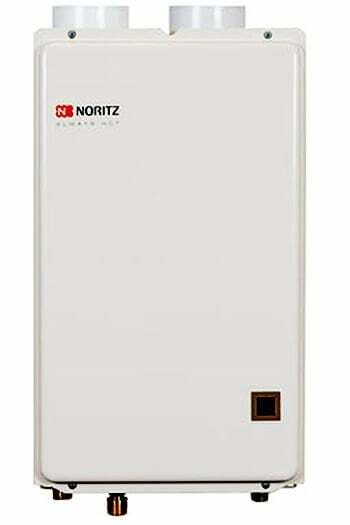 Noritz brand has been one of the leading innovators in the water heating industries with over sixty years of experience. The Noritz NRC661-DV-NG depicts the company’s commitment to providing the customers with high-quality products with the aim of meeting and exceeding the customer expectation. Similarly, this unit is fitted with advanced features that enable the heater to provide you with continuous warm water supply. You can now forget about the guesswork involved while trying to customize the right temperature of the water you need in your home. This unit has an easy to use control that enables you to customize the temperature you need and works to ensure that you get an optimal water temperature. Another reason why you might need to consider choosing this unit is that it keeps your family from Nox emissions. This enables it to operate optimally without compromising any safety in your home. Unlike other models where you may need to hire professional help, you can install this unit easily. To make the installation easy for everyone, you are provided with a detailed user installation manual as well as all the attachment and tools needed. SioGreen IR4000 is a decent tankless water heater for small to medium-sized family home. This unit is reasonably priced and falls in the mid-range price, making it a decent choice for budget-conscious buyers. Unlike the old water heater, this unit is ninety eight percent efficient, enabling you to save a lot of energy, reducing the energy power bills. The model comes with infrared water heater technology that makes use of coil-less innovations. The technology produces the quartz infrared energy that heats the water without necessarily coming into direct contact a heating metal. Since there is no contact, corrosion is minimized allowing for durability. This heater only heats the water you need. This means no water sits in the tank. This reduces the chances of algae and bacteria accumulating in the water. Since it heats water only when it is needed water, very little energy is lost. Since there are no calcium deposits, it is an ideal choice for individuals looking for a unit to use hard heating water or well water. TC-Home 3.2 GPM come with an impressive space saver design that allows you to install anywhere in your home. It has simple controls that make it easy to customize your needs. We also love the durable and impressive performance for added convenience and flexibility. Moreover, this unit feature a classic stylish design that add a touch of style to your house. When considering installing the best home equipment you need to ensure that you have select energy efficient models. 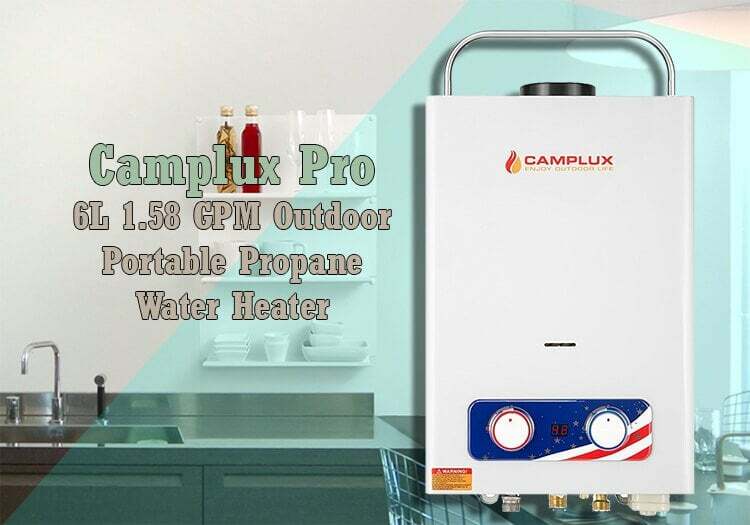 This heater is fitted with a heat exchanger and main burner that adopt combustion technology that decreases gas combustion while giving you hot water. This unit does not only provide hot water for your shower, but it also supplies hot water to your kitchen faucet, dishwasher, and water dispenser. This is essential for optimal performance. This model is equipped with water control linkage that makes it usable in areas where water has low pressure. You can easily control both the cold and warm water. The heater is also equipped with decent features including the manifold auto protection to enhance your safety as well as over water protection function. 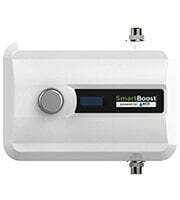 Any individual wanting to instantaneously add one of the best tankless water heaters should consider installing EcoSmart ECOTB240 water heater. 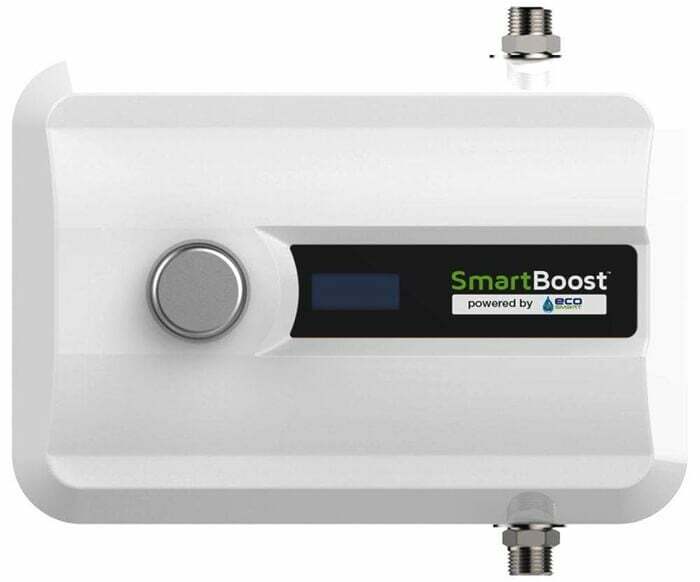 With the Smartboost feature installed on this unit, this unit will provide you with more hot water when compared with models with a tank. Additionally, most people appreciate the adjustable activation temperature, which increases its efficiency. The unit is fitted with advanced features that increase the deliverable hot water by up to 45 percent. This ensures that you will get more hot water within a short time frame. This helps in keeping the water bill down. Additionally, you can set the temperature with an increment of 1F, ensuring that you get the right temperature all the time. This is facilitated by the smart boost feature, which is probably the best feature that makes this unit to stand out. With this feature, it is easy to reach customized water temperatures for various household applications. This unit is constructed using high-quality materials that ensure a performance that you can rely on. Besides, we love the sturdy construction, compact design, as well as simple installation. 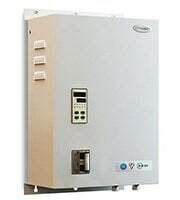 WiseWater 25.6kW tankless water heater is a decent choice for whole house application. This unit has a intuitive control that makes it very easy to use without the need of the user manual. With a compact design that doesn’t have a tank, it will be easy for you to install anywhere inside the house. Everyone would want to have an efficient water heater in his or her homes, especially in cold months. However, very few of us have the luxury of shelling thousands of dollars just to get a water heater. Luckily, for you, WiseWater brand has realized the constant need for affordable and high-performance tankless heaters. This unit is packed with all the features you need in a decent water heater that provides you with continuous hot water in your home. For user convenience and safety, this unit is fitted with advanced features that allow it to defend itself against electricity leakage, over-pressure, scalding, as well as overheating. This ensures that it remains in top condition for a long while ensuring no accidents in your home. The heater also comes with a compact size that makes it a decent choice for individuals who are looking for a model to install in small space such as kitchens, laundry rooms, bathrooms, and even places like apartments, studios, as well as cabins. 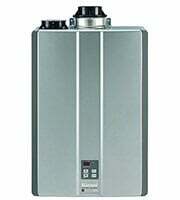 There are two main types of tankless water heaters, the electric and gas tankless water heaters. There is no definite answer to the question which is the best. Both these choices are great since both have their own strengths. Remember each person has his/her specific needs, what is perfect for your friend may not work well when it comes to meeting your needs. Therefore, this reason, the choice of the type will depend on the specific demands on hot water, installation, budget, and personal preference. The below comparison chart will give you an idea of which model will work for you. Selecting the right tankless water heater is not rocket science. However, without the right information it is not easy for you to pick the most appropriate choice. Before we can look at the considerations that you need to have at the back of your mind when making the purchase, let us share some of the benefits that come with this innovative equipment. 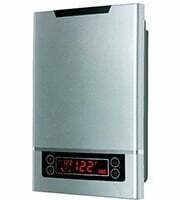 When compared to the traditional water heaters that occupy a lot of space, you will find the tankless models handy. These models require little space allowing them to fit in most places in your house. This makes it easy to install in small areas such as your bathroom, kitchen, and cabin. The main reason why many individuals are considering installing these units in their home is that they utilize the energy better than traditional water heaters. With the ability to utilize heat energy of about 85-99 percent, you can expect your water to be heated faster. While comparing with the tank heaters that barely crosses 65 percent efficiency, you can enjoy hot water in your homes without worrying about the energy bill. With the high-efficiency rate, you can expect your gas or electricity bill to reduce by up to 25 percent. Another reason why you need to consider installing one of the best tankless water heaters is their ability to provide you with continuous water supply. 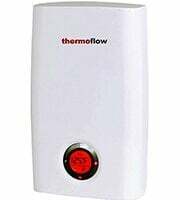 Unlike the traditional water heater that has the tendency of the water dropping after using a full tank, these model give supplies you with water at a constant temperature. This means you do not have to deal with cold jets and extremely hot jets in the showers, which can be uncomfortable. Well, now that you know some of the benefits of choosing a decent tankless water heater, let us look at the main considerations that you need to bear in mind while purchasing a tankless water heater. With various models to choose from, it can be the trick for most people to find the ideal balance between the functionality and price. However, considering the following tips will help you in getting exactly what you need. 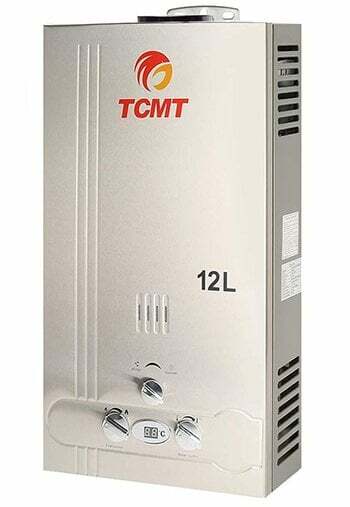 Since the tankless water heater only when it is needed, it will minimize wastage of energy. However, this doesn’t mean that all the tankless water heaters are the same. These models come with different rating depending on the amount of the heat it generates. This is usually indicated in Kilowatts (kW) or British Thermal Units (BTUs). The volume of water delivered in a minute is usually indicated in GPM (gallons per minutes). It is a no-brainer that a unit with higher numbers in BTUs and GPMs are great for individuals with a large family that requires a constant supply of water. You should also look at the size of the water heater. Are you looking for a model for a large home or something that fits in a small kitchen or bathroom? Generally, these units come with a compact design, but you can find models that are sleeker than others are. Most often, the smallest models are ideal for small spaces but do not provide a lot of hot water for multiple uses. The power of the tankless water heater will depend on the specific use. If you are looking for a model to use in a home with a large family it should be powerful enough offer you with enough water to use in several bathrooms. Besides, it should have the ability of supplying hot water to the kitchen sink and dishwasher. 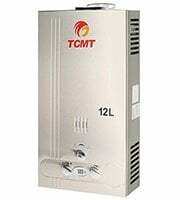 A quality tankless water heater is expected to perform efficiently for many years, so it is not surprising to find that these units do not come cheap. However, this doesn’t mean that you have to break your bank to get them. By doing the extensive research, you can find a model that fits your budget and offer the performance you are looking for. 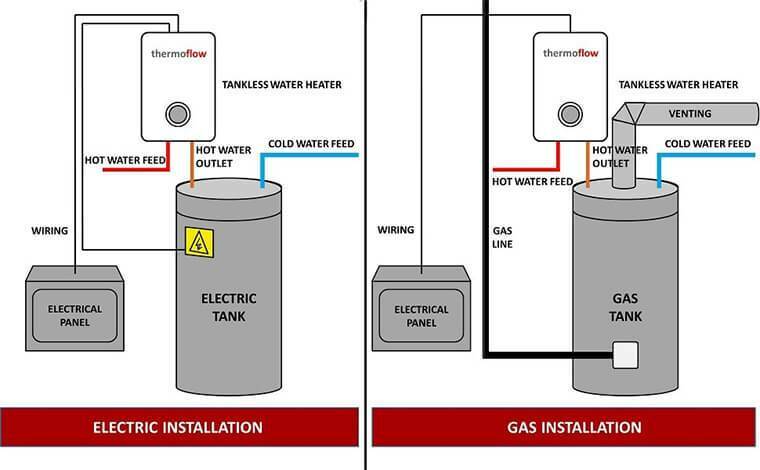 As you can see from the above models, we have both electric and gas tankless water heaters. Since the models operate differently, there are different installation requirements. Installing most of these heaters is simple though you need basic plumbing skills. You also need to follow the basic instruction guide that comes with the unit. Another thing you should look at when picking the model is the convenience of use. This is often facilitated by the number of features that come with the unit that you select. Some of the basic features to look at include temperature adjustment, customizing the performance of the unit as well as the ease of use. Basically, the best model should have an intuitive control that allows you to customize the temperature of the unit easily. If you are an RVer who enjoy traveling a lot and enjoying outdoor activities such as hiking, rock climbing and biking could enjoy taking a refreshing shower after spending all the day in the outdoors. Having a six-gallon tank of hot water can be used quickly and may not give you enough water for your needs. However, getting the best tankless water heater will allow you to get continuous hot water whenever you need. Besides, the tankless water heaters are easy to carry and fit in tight spaces, so you do not have to worry about storage space in the RV. We believe that our customers deserve the best product to make their lives better. For this reason, we have invested a lot of energy, time, and resources to ensure that you get nothing short of the best. We start by looking at the best models on the market by looking at the units with the highest ratings on Amazon and other independent sites. Sometimes our expert also purchases the models, test them, and rate the product according to our findings such as functionality, ease of use, design, and power. We also consider the customer feedback and satisfaction level to come up with a conclusive list. 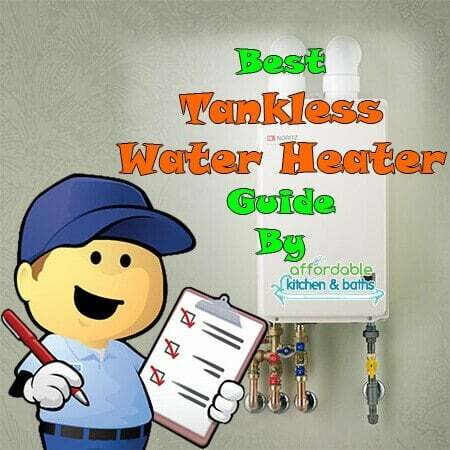 Generally, the tankless water heater is better than the traditional water heaters. However, to help you get out of these models, there are some things you need to know. First, the tankless units are pricey, costing up to twice as much as the traditional models. Besides, since some of the tankless systems run from natural gas there is potential for carbon monoxide leaking. For this reason, you need to have a licensed professional to manually inspect and provide the required maintenance annually to ensure that you are safe. Before you can settle on the best tankless water heater, you should start by considering the average water you need and balance that with the price. Doing this will help you to enjoy a continuous supply of water in your home to suit your needs. Besides, although there are other ways that you can reduce water and energy usage in your home, we are sure that investing in any of the above models will surely bring a significant reduction in energy bill while giving the comfort you need. All the best! Solar water heater system is not only the domestic appliance. It will develop more great in the near future for it is transfering to a more efficient, widely used in industrial area. This solar water heater is not limited in demestical industry,but it will lead to a wide future in mutilcenturial development era.